I recently came across an interesting article by Andreas Peetz which shows you how to patch an ESXi host using an image profile that is directly available on VMware's online depot within the ESXi shell. I knew that VMware had online depots for use with VUM and Auto Deploy but I was not aware of this particular method, especially directly from the host. Note: There are many ways that you can patch/upgrade your ESXi hosts, here is another article that provides more details for command-line only methods. If you are able to successfully connect to the online depot, you see a list of all the ESXi Image Profiles that are available to you. 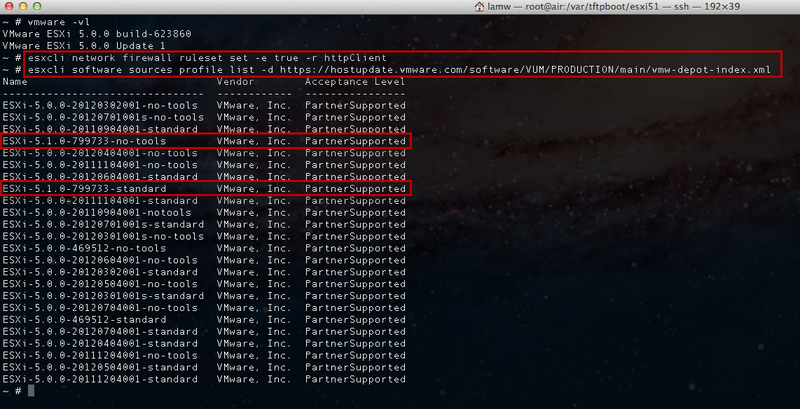 You will see two ESXi 5.1 Image Profiles (these were recently published), one with VMware Tools and one without VMware Tools. Note: Before you begin, make sure you do not have any running VMs and put your host into maintenance mode. This can take a few minutes to complete depending on how fast you can pull down the Image Profile. Once it is done, you will see all the new VIBs that have been updated and you will be asked to reboot for the changes to go into effect and then you will be running ESXi 5.1! Pretty cool IMO! 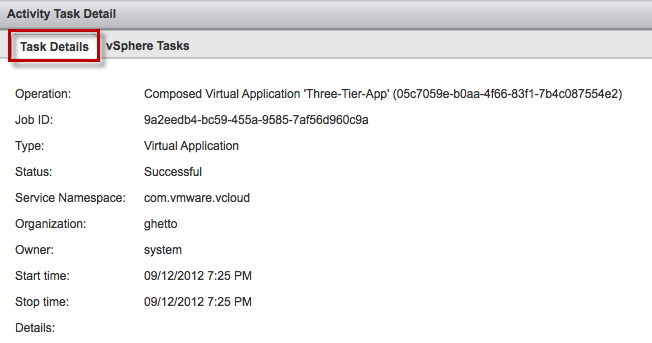 vCloud Director 5.1 Introduces "Open in vSphere Web Client" & Task Correlation … Awesomeness! Have you ever had to troubleshoot something in vCloud Director such as looking into a particular vApp and then realizing you needed to jump over to the vSphere environment to continue troubleshooting? This meant you had to perform a separate login to your vSphere environment and most likely using a different set of credentials and then find the set of Virtual Machines that made up that vCloud Director vApp ... painful and annoying right? 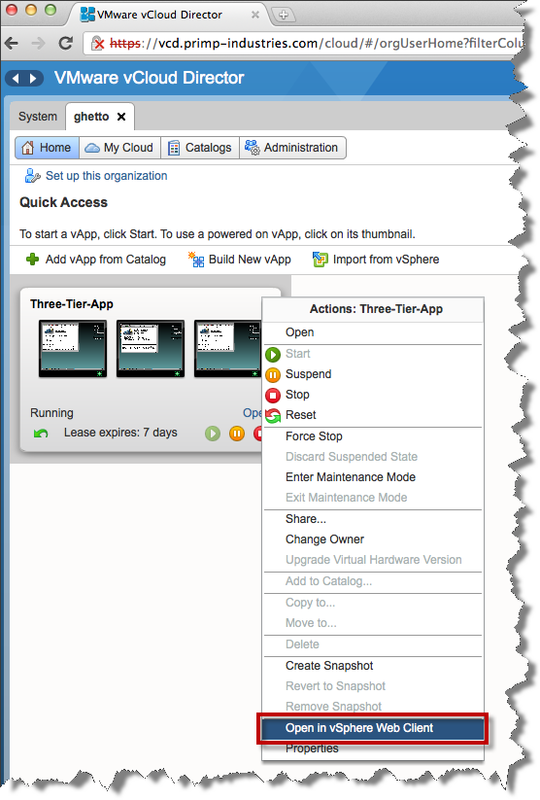 Wish you could just right click and jump straight to that vApp construct in vSphere? 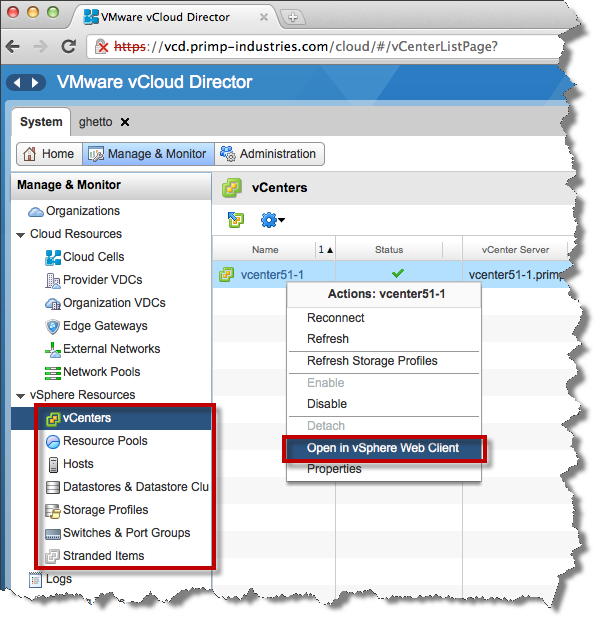 Well, now you can with the latest release of vCloud Director 5.1 which introduces a new option called "Open in vSphere Web Client". In the screenshot above, I have a vCloud Director vApp which contains 3 Virtual Machines and I want to jump straight to that object in the vSphere Web Client. 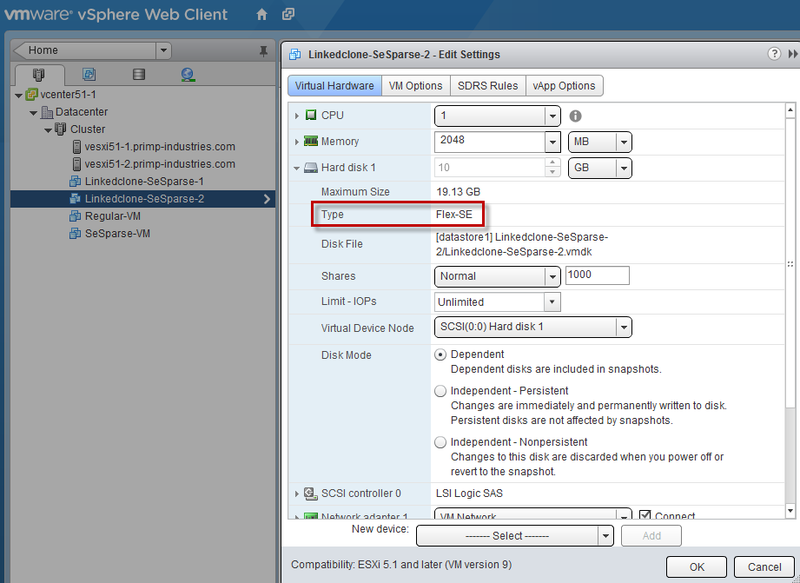 To do so, simply right click on the object and select "Open in vSphere Web Client". This will open up a new browser to the vSphere Web Client and locate the object in the appropriate vCenter Server and automatically log you in using the new vCenter SSO. Pretty cool huh!? This new option is not just limited to vCloud Director vApps and VMs, but applies to any vSphere object found within vCloud Director. Note: You will need to be a System Administrator in vCloud Director to perform this operation as you will need access to the vSphere infrastructure. Another challenge that you might have faced while troubleshooting in vCloud Director is to be able to correlate the tasks generated from vCloud Director and map those back to vSphere tasks in vCenter Server. This is not a trivial thing to do and required you to jump between vCloud Director and vCenter Server manually correlating the tasks. In vCloud Director 5.1, this has been enhanced by providing users with a single view for a given vCloud Director task and all the associated vSphere tasks that were created. When you open a given vCloud Director task, you will be defaulted to the vCloud Director task details as you would expect. In the same view, there is also a new tab called vSphere Tasks which contains all the vCenter Server tasks generated from that given vCloud Director task. As you can see from these two enhancements, you will be able to quickly and easily view all tasks that have taken place between vCloud Director and vCenter Server, all from a single location. 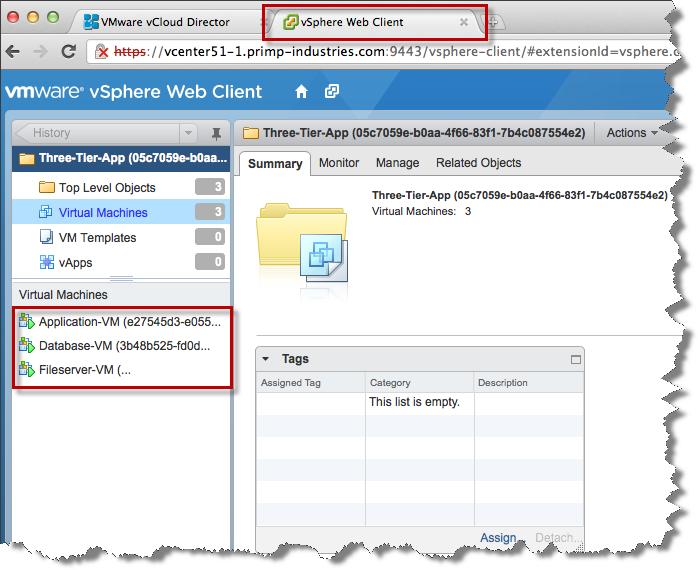 If you need to drill down further into the vSphere layer, it is simply a right click and you will be taken directly to the vSphere object in the vSphere Web Client without having to provide additional credentials. Just like you could in the old vSphere C# Client, users can also configure a session timeout for the new vSphere Web Client in the latest release of vSphere 5.1. This not only ensures that idle sessions automatically disconnect after a certain period of time but also helps reduce the resources consumed on the vCenter Server as each session allocates a certain amount of resources. To configure the session timeout, you will need to login to the server running the vSphere Web Client service (which is usually your vCenter Server) and find the webclient.properties file and change the default timeout and then restart the vSphere Web Client service. For the VCSA, the default timeout value is 120 minutes and I assume it is the same default for the Windows vCenter Server. You will need to restart the vSphere Web Client service for the changes to go into effect. For the Windows vCenter Server, just restart the vSphere Web Client service and for the VCSA, run the above command. In my previous article, I showed you how you can easily create your own SE Sparse (Space-Efficient) disks for you virtual machines running on vSphere 5.1. In addition to just creating new virtual disks using the new disk format, you can also create SE Sparse Linked Clones by leveraging the vSphere 5.1 API. I had previously shared a vSphere SDK for Perl sample script called vGhettoLinkedClone.pl that allows you to create your own Linked Clones and I have updated the script to now support the new SE Sparse disk format. The script now includes new parameter called --convert which allows you to specify whether or not the destination Linked Clone should follow the same source virtual disk format or the new SE Sparse disk format. Remember to upgrade your VMs to the latest ESXi 5.1 compatibility and later (virtual hardware version 9) if you wish to leverage the new SE Sparse disk format. The way this is accomplished is by specifying a new disk backing VirtualDiskFlatVer2BackingInfo in the VirtualMachineRelocateSpec and passing in the deltaDiskFormat to be of type seSparseFormat. Disclaimer: This is for educational purposes only, this is not officially supported by VMware. Please test this in a development environment before using it on actual systems. If we head over to our vSphere Web Client and take a look at our new Linked Clones, we can confirm their virtual disks is using the new SE Sparse disk format.